Restore your tile grout with Mapei® Grout Refresh colorant and sealant. 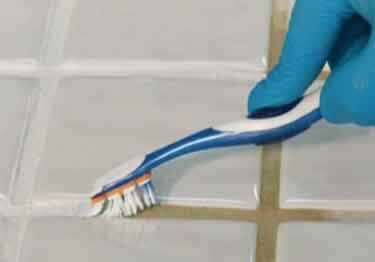 This universal polymer-modified grout colorant and sealant is water-based, nonflammable and ready-to-use. It's easy to apply and clean. Ideal for interior and exterior, horizontal and vertical applications. Refresh your current grout color or change your grout color with one of the 40 available shades. May help contribute to LEED certification of projects. See product data sheets for more information. Interested in refreshing my kitchen floor. Not sure of the color I need. Can I get samples of the three following colors 02 Pewter 103 Cobblestone 105 Driftwood Need to cover about 450 square feet. How much product would I need. Can you show me the colors. It's hard to pick a color out with just the name of it. Thank you. Just got new floor installed grout was way to light bought grout refresh now what to do. Floor has never been cleaned so do I clean then use refresh or use refresh then clean. How long does it take before you could mop? By using Grout Refresh will this cause or can cause pin holes? How long will the Grout Refresh Colorant and Sealant last? Color etc? What's the best way to getting in off when it dries too soon or tries too much? Hello, Can you tell me if I use the Grout refresh in my shower, how long will it take to totally dry so we can start having showers again? Thank you for you assistance. Looking for a product that will seal a shower floor that is currently leaking through to the basement. We've checked all the plumbing and its fine. We're quite sure the 10 year old floor has become porous. The floor consists of 1 inch by 1 inch tiles. Will your Grout refresh colorant and sealant help stop the water leaking through to the basement? How long does the sealant part last? Thank you for your answer.WHAT IS THE BEST WAY TO APPLY IT, AND THE TILE SIZE IS 12" AND THE GROUT WIDTH IS 5/16"
How big an area will one bottle cover? The grout in my shower is in very bad shape and want to cover that up. will this product do that? Can it be applied on top of grout sealer in my shower? What are some non-solvent-based cleaners that can be safely used ? Can I use this product to stain mortar joints between pavers (outside staircase)? how much will a bottle cover ??? can you please tell me if your grout paint can get wet in a shower stall? Will it mold on a grout line if it gets wet. It will not be submerged under water. Just wet from a shower. I have used Mapei GroutRefreshColorant with porcelain tiles---GREAT! Can it be used with Marble tiles. Thank-you. Could you tell me if your Grout Refresh Colorant can be used over your Keracaulk product? I am looking to darken my bathroom grout and used Keracaulk for the corners. Thank you. awesome product. my dad was a tile guy he recommended this product to me cannot beat it. I have stone countertops in my bathroom, I was going to purchase a solid piece for the counters. Then decided to try a new grout �Acorn� and glossy sealant. I couldn�t believe the end results! Better than I could have amagined, better than new. Just did the house in wood look tile . Wanted a dark matching grout. We decided on truffle . 8 sealing & finishing products penetrate surfaces to protect & enhance beauty of natural stone, ceramic tile, and quarry tiles.